we welcome new ones so we can grow! So we know how changes may relate! New members are needed for us to survive. The Noble County Chapter RTA was organized on September 14, 1965 with the assistance of Charles W. Layman, a former Noble County teacher and trustee for Ohio Retired Teachers Association and Edwin Roe of Zanesville, Eastern Ohio Director of Ohio Retired Teachers Association. The first president of Noble RTA was William Forshey, Vice-President was R. R. Ullman and Secretary/Treasurer was Sadie Brothers. The committee to prepare the constitution and by-laws included A. G. Wharton, Minerva Frazier and Wayne Mallett. 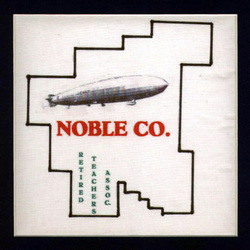 Noble County was the site of the crash of the dirigible U.S.S. Shenandoah. You can read more about this crash at the following web site: http://www.noblecountyohio.com/shenandoah.html. Noble County has two high schools, Caldwell and Shenandoah. The latter was named for the U.S.S. Shenandoah and the insignia for the school is The Zeps for Zeplinian.